One month after the completion of the sixth annual Tour de Georgia presented by AT&T, a post-event evaluation has determined that the direct economic impact of the event reached $38.6 million for Georgia. This surpassed the 2007 economic impact number of $27 million by 40%. The 2008 Tour de Georgia presented by AT&T, recognized as America's premier, professional cycling event and rolling festival that covered over 600 miles and seven days each spring, concluded April 27 in Atlanta. Economic impact was determined using data collected by crowd intercept surveys at all start and finish host venue locations. North Georgia College and University managed the survey development and data collection. The Bureau of Business Research and Economic Development of Georgia Southern University was responsible for data input and analysis. The regional input-output modeling program IMPLAN was used to construct a model of Georgia and models of each region by stage. A total of 1,196 completed surveys were collected between April 21-27 at the 12 host communities which staged either a Tour start or a Tour finish venue. "We can't tell how much of the change is due to methodology, but we believe that one of the reasons for the large increase (in economic impact) over last year is inflation, particularly in gasoline. Some of the increase is also due to the significant increase in the number of international visitors. The increase in international visitors is probably due to the devaluation of the dollar making a U.S. trip more affordable," said Phyllis Isley, Director, Bureau of Business Research and Economic Development at Georgia Southern University. Economic indicators included assessment of dollars spent by visitors (residents of the area not included) for meals, lodging, transportation, retail and miscellaneous recreation. Analysis of crowd sizes was determined by Georgia State Patrol and local law enforcement estimates. While the attendance figures for 2008 were down 20% from last year, over 400,000 this year as compared to 515,000 in 2007 and 500,000 in 2006, spending was up significantly during the event. 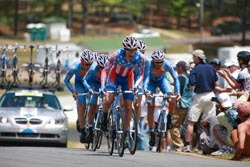 "We were delighted to host the Team Time Trial stage of the Tour de Georgia presented by AT&T. For a first time event - and on a Thursday - we were extremely pleased with the spectator turnout and the event overall," said Road Atlanta President Geoff Lee, regarding an estimated attendance of 20,000 fans at Stage 4. "A majority of these very enthusiastic cycling fans were making their first visit to Road Atlanta and obviously had a good time. From a marketing standpoint, the Tour was very successful for us. We hope these new fans will come back for our major events like the 11th annual Petit Le Mans Oct. 1-4." The Tour was founded in 2003 as a tourism vehicle to showcase Georgia and its communities by the marketing arm of the state, now known as the Georgia Department of Economic Development. GDEcD is responsible for developing tourism, which is Georgia's second largest industry behind agriculture. The Tour has proven that it is indeed a strong sports property that is more than a bicycle race. In just six years since its inception, the Tour de Georgia has produced big numbers - 3.2 million spectators and over $186 million direct economic impact to the state of Georgia. "The Tour de Georgia presented by AT&T is a terrific event that brings long-lasting economic impact to Georgia," said Ken Stewart, commissioner of the Georgia Department of Economic Development, the agency that serves as a marketing arm for the state and presenting sponsor of the Tour de Georgia. "Our communities look forward each year not only to the excitement surrounding the Tour, but to the worldwide exposure they gain by hosting it. The Tour de Georgia is not only one of the world's premiere cycling events, it is a major international tourism attraction for Georgia." In addition, the Tour de Georgia presented by AT&T is proud to have set a record in 2008 for funds raised for its beneficiaries, the Aflac Cancer Center and Blood Disorders Service of Children's Healthcare of Atlanta and the Georgia Cancer Coalition. This was the first year the Tour engaged with helping Children's Healthcare, and it was the sixth consecutive year partnering with the Coalition. With donations pledges from Tour sponsors and generated by ancillary events throughout race week, the Tour de Georgia was able to donate over $500,000 for its charities, doubling what had been done in the past five years. "The Tour de Georgia presented by AT&T is an international sporting event that brings thousands of spectators and cyclists to our great state. We also worked very hard to promote healthy living and lifestyles among our citizens and guests. This year's Health & Wellness Expos were a hit at every stop, from Savannah to Atlanta. We were able to a raise a record amount of money and awareness for our beneficiary as well, Children's Healthcare," said Lt. Governor Casey Cagle, who serves as the Chairman of the Tour de Georgia Foundation. The Tour de Georgia gained international stature in 2004 when Tour de France champion and cancer survivor Lance Armstrong won the event. In 2005 the Tour de Georgia was elevated to a 2. Hors Classe (2.HC) road cycling competition by the world's governing body of the sport, the Union Cycliste International (UCI) and expanded from six to seven days. This made the Tour de Georgia one of the highest rated stage races outside of Europe, and gained the distinction as a tune-up event for the prestigious Tour de France. Four teams in the field this year expect to race in the Tour de France in July, including American-based teams High Road and Slipstream Chipotle presented by H30, German-based Gerolsteiner, and Denmark's Team CSC. The 2008 Tour de Georgia presented by AT&T was won by Team High Road's Kanstantin Sivtsov of Belarus. The average overnight visitor spent $380 per day at the Tour; 55% of that going to accommodations and transportation costs. AT&T Inc. is a premier communications holding company. Its subsidiaries and affiliates, AT&T operating companies, are the providers of AT&T services in the United States and around the world. Among their offerings are the world's most advanced IP-based business communications services and the nation's leading wireless, high speed Internet access, and voice services. In domestic markets, AT&T is known for the directory publishing and advertising sales leadership of its Yellow Pages and YELLOWPAGES.COM organizations, and the AT&T brand is licensed to innovators in such fields as communications equipment. As part of its three-screen integration strategy, AT&T is expanding its TV entertainment offerings. Additional information about AT&T Inc. and the products and services provided by AT&T subsidiaries and affiliates is available at www.att.com (c) 2007 AT&T Knowledge Ventures. All rights reserved. AT&T and the AT&T logo are trademarks of AT&T Knowledge Ventures. For more information, please review this announcement in the AT&T newsroom at www.att.com/newsroom. The Tour de Georgia presented by AT&T is North America's premier, professional cycling event and rolling festival of community activities. The Tour was first held in 2003 and has become a spring tradition with a varying route of over 600 miles of racing. The event is sanctioned by the Union Cycliste Internationale (2.HC ranking), and is part of the USA Cycling Professional Tour USA Cycling, Inc., making the event one of the top stage races for elite athletes around the world. The Tour de Georgia is owned and operated by the Tour de Georgia Foundation (501 c3) and managed by Medalist Sports. The event benefits the Aflac Cancer Center and Blood Disorders Service of Children's Healthcare of Atlanta, and the Georgia Cancer Coalition. Fan information is available at the official website, including host venue information, merchandise offerings and maps, www.tourdegeorgia.com.